This year is the second year that I’m experimenting a little bit with early spring sowing. Basically trying to sow some herbs and vegetables inside so they get a head start for when the temperature goes up. Not as a way to save money, or to be self sustaining, but more because it’s a fun thing to do and it’s nice when you can use fresh herbs during cooking. 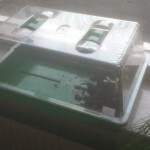 There are two propagators where I can plant the seeds. 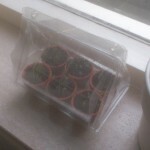 A propagator is a small garden frame, a garden frame is a small greenhouse. So these are small. The first one is the smallest, it has room for 6 small jars. In the left two jars I planted chives (bieslook), the middle two contain dill (dille), and the right two have parsley (peterselie) in them. The dill was the first to come out of the ground, the parsley in the top right one just showed itself today. The other one is bigger, though still small: It’s about the size of a sheet of A4 paper. It will be moved outside in a nice and sunny place once the temperature gets higher. Inside you see some lettuce. The lettuce was even faster then the dill, it’s almost time to give it more space. See below for images for both of the propagators. You’ll see the big one is not filled completely. These pictures come straight from my cellphone, so they could be nicer of course. All of this was planted on the second of March, so it took between one week and eleven days for the seeds to show themselves. 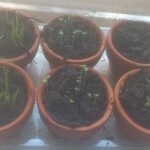 How to do spring sowing? Make a layer of about three centimetres of the loam soil, compress it. Fill it until it reaches three centimetres again. Drop the seeds from at least five centimetres height. Add more soil. For the seeds that I planted I needed only one or two centimetres soil, but for other vegetables you might need up to eight centimetres. Compress it gently and give lots of water. If you have jars (with a hole in the bottom!) 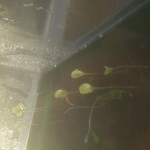 like my small one, place them in water for 10 minutes, then the soil will take all the water it needs. Put it in a sunny place and wait. Give some more water after a week, and hope for the best! I’m not quite sure how to say this; you made it extrmeely easy for me! I аm goіng to convey her.